The City of Avondale Estates announced today that Google Fiber is coming to the City, giving residents access to one of the fastest-ranked Internet options in the country. Google Fiber provides gigabit Internet connections up to 1,000 megabits per second, a vast improvement over the average American broadband speed of 11.5 megabits per second. Widespread access to gigabit Internet drives billions of dollars of economic growth, according to the Fiber to the Home Council Americas. Working with Google Fiber to implement their network is a long-term investment in a prosperous future for the City of Avondale Estates. "The City of Avondale Estates is excited to work with Google Fiber to bring extremely fast Internet and TV service to the community," Mayor Pro Tem Terry Giager said. Improving broadband speed and choice for residents has been a priority for the City of Avondale Estates for years—in April 2010, the City passed a resolution to respond to Google's "Think Big With a Gig" challenge, which invited U.S. cities to tell Google if they'd want the company to build a new, gigabit-speed network in their community. 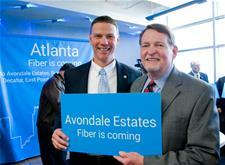 Avondale Estates joined with four other cities under the name of Atlanta Urban Area Partnership for Google Fiber to craft a joint response and collectively bolster their chances of bringing the technology to the area. In February 2014, Google Fiber announced that nine metro-Atlanta cities—Atlanta, Avondale Estates, Brookhaven, College Park, Decatur, East Point, Hapeville, Sandy Springs and Smyrna—were selected as potential fiber locations. The City of Avondale Estates heard from numerous residents asking the City to make the possibility a reality. City staff worked closely with Google Fiber to meet their requirements, and now that hard work has paid off. Kevin Lo, Google Fiber Director of Business Operations, lauded City efforts. "We are here because of the hard work, passion and commitment of the city and its leaders," Lo said. "The next chapter of the Internet will be written at gigabit speeds. These new networks will lay the foundation for a wave of innovation and economic growth. The City of Avondale Estates is the perfect city to show us what's possible, and we can't wait to see what the City will do with Fiber." There is huge demand for faster Internet speeds, because no one likes to wait on the web. Unfortunately, many of the things people love to do online require a lot of bandwidth, which means that, using today's connections, people often get stuck waiting for pages to load or for videos to buffer. Statistics show that people walk away from slow-loading sites. And gig networks aren't just about meeting today's speed needs. The next leap in broadband speeds—to gigabit Internet—will lead to innovation that's unimaginable today, just as the shift from dial-up to broadband did. Google will be working closely with City leaders on the next steps to build a brand new fiber-optic network capable of delivering these gigabit speeds throughout the City of Avondale Estates. The next stage of work includes designing and planning a new fiber-optic network down to a very detailed level. After this process, which will take several months, Google Fiber and the City of Avondale Estates will begin constructing the network. "Google Fiber's efficiency and thoroughness during the exploratory process bodes well for the construction phase, and we look forward to the day when the Avondale Estates community will have the option to enjoy the network's speedy connectivity firsthand," Giager said. Google Fiber is an Internet and TV service that provides Internet speeds up to one gigabit per second along with hundreds of HD TV channels. Google Fiber is currently available in Kansas City, Kansas, Kansas City, Missouri, Provo, Utah, and Austin, Texas. For more information about this announcement, visit the Google Fiber blog. Residents interested in obtaining Google Fiber once it's ready may enter their home and email addresses on the Google Fiber site. Pictured with this story: City Manager Clai Brown and Mayor Pro Tem Terry Giager attended the January 27 Google Fiber announcement and news conference at Google’s Midtown Atlanta office.